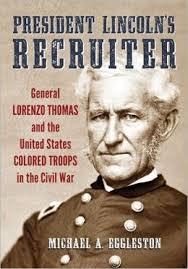 When the Civil War began, Colonel Lorenzo Thomas was a paper pusher; as the army's adjutant general, much of his work involved processing resignations from officers planning to join the Confederate States of America. If this were the extent of his wartime activities, he would have hardly merited Michael Eggleston's earnest, if uneven, effort to document his life. But when Edwin M. Stanton was appointed Secretary of War in January 1862, Thomas' life changed dramatically. His duties during the rest of the war more than justify documenting his vital contribution to the eventual Union victory. Stanton and Thomas instantly disliked each other and, in March 1863, Stanton ordered his nemesis to the Mississippi Valley to get him out of Washington and to recruit African American men into military service as permitted under terms of the Emancipation Proclamation. Eggleston rightly concludes that Thomas "was not simply a senior recruiter, but a man charged with initiating a new Union policy, breaking down opposition to African American soldiers and resolving issues with the new policy." It was a big job and Thomas proved to be just the man to carry it out. According to Eggleston, "he managed to recruit and organize 41 percent of the African Americans who fought in the Civil War." Eggleston does an excellent job describing how the troops were raised and the process that was created to select and train white officers to lead the black regiments. He rightly concludes, though, that Thomas' job involved much more. Thomas had to address issues about unequal pay, the care and feeding of the women and children who frequently accompanied the men into Union camps, finding physicians to treat the sick, procuring quality equipment, and providing remedial education and training for an illiterate soldiery. Eggleston quotes from Thomas' final report dated Oct. 3, 1865, in which Thomas admits, "I entered upon the duty by no means certain at what I might be able to effect." Thomas' effect was indeed substantial; by the end of the war, African Americans comprised 12 percent of the Union Army's strength. The end of the war did not end Thomas' military service or his contentious relationship with Stanton. Thomas resumed his duties as adjutant general until February 1868, when he inserted himself into the bitter confrontation between President Andrew Johnson and the Radical Republicans in Congress. Johnson asked Thomas to serve as Secretary of War, replacing Stanton. Thomas accepted, with the provision that he be restored to his wartime rank of major general. This arrangement violated the Tenure of Office Act, legislation passed by Congress to hamstring Johnson from filling his administration with supporters of his plans to reconstruct the South. Thomas' appointment and the attempt to remove Stanton from office gave Radical Republicans the justification they needed to initiate impeachment proceedings against Johnson. Thomas testified before the Senate to the effect that his actions were designed to test the Act's legality in the courts. According to Eggleston, "Lorenzo Thomas may have turned a number of Radicals toward acquittal." Johnson was acquitted by a single vote and Thomas' poor performance on the stand made him a pathetic laughingstock to many. He returned to the position of adjutant general until he retired in 1869. Thomas died in Washington, DC in March 1875. Unfortunately, several sections of Eggleston's book do not seem germane to the story of Thomas as a "Recruiter of United States Colored Troops." For example, Eggleston describes the significant battles fought by the USCT and the mini biographies of African Americans who received the Medal of Honor, which smack of padding. He also includes a "Biographical Dictionary," which takes up 14 pages with irrelevant personalities, including John Quincy Adams, Andrew Jackson, Benito Juarez, Sylavanus Thayer, Carl Schurz and James Monroe. In addition, Eggleston reproduces all 11 Articles of Impeachment, which could easily have been summarized in the text. Last, Appendix B, "Early Recruiting Efforts," documents claims of African American participation in the Confederate Army, which includes sources that readers should investigate and evaluate before drawing any conclusions.